Chocolate meringue crust filled with whipped cream topping and fresh berries then drizzled with raspberry sauce. A perfect Fourth of July dessert! 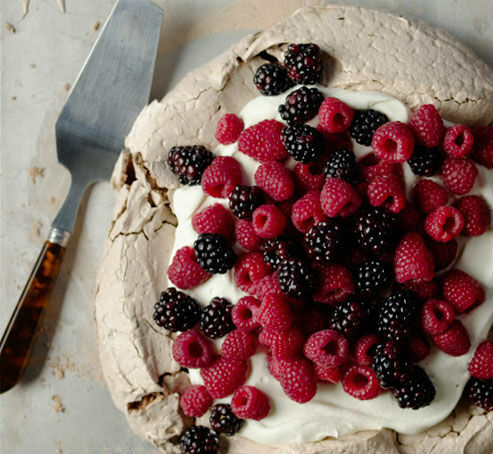 Here is an easy dessert recipe for Chocolate-Berry Meringue. Preheat oven to 350 degrees F. Allow egg whites to stand at room temperature for 30 minutes. Cover a very large baking sheet with parchment paper or foil. Draw a 10-inch diameter circle on paper, leaving a 1- to 2-inch margin outside the circle; set aside. To make the chocolate meringue, beat egg whites with electric mixer on medium to high speed until soft peaks form (tips curl). Add sugar, 1 tablespoon at a time, beating on high speed until stiff peaks form (tips stand straight) and sugar is dissolved. Gently fold in bittersweet chocolate, unsweetened cocoa powder, and balsamic vinegar. Spread meringue mixture inside the circle drawn on prepared baking sheet. Place in oven. Immediately reduce oven temperature to 300 degrees F. Bake for 1 hour. Remove from oven; cool completely on baking sheet on rack. Carefully remove meringue from parchment; transfer to a serving platter. While waiting for the meringue to cool, prepare the whipped cream filling and raspberry sauce. In a chilled bowl, beat cream, sugar, and vanilla until soft peaks form; refrigerate until ready to assemble. Puree fresh raspberries using a blender; sieve, if desired. Transfer to a small bowl and sdd sugar. Stir until dissolved. To assemble, spread whipped cream filling onto meringue. Top with berries and chocolate shavings. Drizzle meringue wedges with raspberry sauce. Serves 10.